It’s so weird how much hatred there is of white people on campuses nowadays, at least some campuses. I’ve addressed this before, but the main reason for it is the white-haters, once they reach critical mass, push out all the rest, leaving no room for anything on our campuses but hatred. 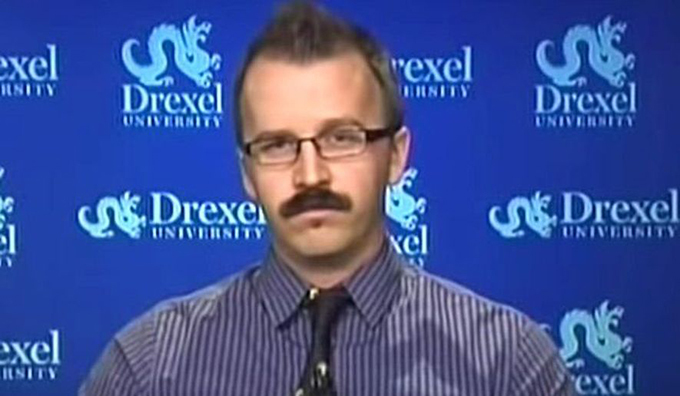 One such campus is clearly Drexel University, a private school in Pennsylvania with tuition around $50,000 a year—it’s a curious but documented relationship that as tuition goes higher, so too does the hatred off all things non-Leftist. Despite the tuition, it has some 25,000 students. It should go without saying that if anyone, professor or not, tweeted out the above while substituting “White” for “Black” or “Jewish,” there’d be a huge outcry, with definite violence and a loss of job at the very least. To the world’s credit, there was some outrage for this, and even the University admin managed to speak out, calling the tweet “reprehensible.” No, they weren’t going to fire him…it’s so curious how protective our campuses are of free speech and academic freedom when it’s Leftist views being expressed, but such concerns vanish quickly when it comes to other views. Wait…what? I bet the gentle reader didn’t hear about this professor’s desire for the murder of hundreds of millions of innocent people at all, or perhaps maybe a single blurb, quickly forgotten. I do wish he could have mentioned what, exactly, right-wing, white supremacist media outlets he’s referring to. I’m unaware of any, truth be told, but likely this is just the usual standby of RACISM. He also says he’s received death threats; I trust he’s passed those on to the police for proper investigation. I’ll be shocked, shocked, when I hear of no arrests or criminal charges. The professor tried to pass off his tweet as not serious, as mocking the whole idea of white genocide, but such claims ring hollow when one considers his other activities, such as saying the Vegas shooting was a product of “white supremacist patriarchy” and claims that white supremacists are on the rise. What’s interesting here is, even in resignation, the university covers for him, says he was a fine scholar. He quickly found a position elsewhere, and I wish him luck (and prudence) in his future endeavors. My case and many others show just how cynical such appeals are, and how little the Right cares about academic freedom. Wait, what, again? I suppose there have been a few cases of Right-ists shutting down Leftist speakers, but Leftists have been doing so, often violently, at a ratio of 50 to 1, if not much, much, higher. I am, of course, against both, but when I start seeing Right wing activists showing up with guns, knives, and other weaponry at speeches given by Leftists, I’ll start posting on it, honest. I’m not convinced this guy is aware of the big picture. Honest, if you tell hundreds of millions of people that you want them dead on the basis of their skin color, it’s actually quite natural for some of them to be a little upset with you. It’s very curious that he thinks it’s the upset people who are the racists. As is often the case with people like this, they demonstrably don’t believe what they’re saying. The professor is white, after all, so if he truly believed in white genocide, he’d kill himself and his family, right? Instead, he says he’s resigning to protect his family from being killed or so he (supposedly honestly) says. Hmm. In the past year the forces of resurgent white supremacy have tasted blood and are howling for more. There’s only so much of this I can take, but again the above exhibits remarkable ignorance. You threaten people with death and then call them racists for not liking it much? Seriously? Howling? Uh, do you have any examples? I mean, we can find folks on the other side of the political spectrum literally howling at the sky in despair at not getting their way in an election…and that strikes me as far more disturbing than people concerned about threats to their very existence. How does the cry of RACIST never get old? It sure gets old hearing it all the time, every time, whenever one of these people gets upset. To faculty: tenure is a crucial buffer against those who would use money to dictate the content of higher education. But in a neoliberal academy such protections are far from absolute. We are all a single outrage campaign away from having no rights at all, as my case and many others make clear. The difference between tenure-track faculty and the untenured adjunct majority — which has far more to do with luck than merit — is a difference in degree not in kind. Absolutely, what’s being done to most professors, adjunct-hood, is a crime, and it’s good for him to raise awareness of this issue. But the good professor was tenure-track before he resigned, and he wasn’t fired due to an “outrage campaign,” administration actually stood by him as he raised awareness of his school as a hotbed of Leftist hatred. So, his message is a little mixed here, to be sure. Again, he’s unaware that conservative faculty cannot get hired for tenure positions at many institutions now, and so this point of view is seldom heard on campus, as conservative faculty who dared to speak out even a little, much less propose genocide, are removed from campus fairly quickly. Is it a good thing that he’s gone from campus? I don’t think so, but it’s fair to say it’s an irrelevant thing. It’s clear this campus supports such views, so the students there will get to hear of endless hypocritical white hatred. I think it’s a bad thing that they won’t get to hear other views, but I’m sure the professor would simply call me RACIST for expressing such an opinion.